When someone strung bananas from nooses on American University’s campus last May, Lauren Lumpkin first heard about it from friends at The Blackprint. At the time, the publication was new to AU. Then-seniors Elisha Brown and Taryn Daniels founded the site earlier that school year. They created the site specifically to cover the concerns and culture of students of color. That academic year began and closed with racist incidents involving bananas. In September, someone flung a banana peel at an African-American freshman in her dorm. Eight months later, their year closed with yet another banana-related racist incident, when someone strung bananas from nooses in three spots on campus. The slurs scrawled on the bananas targeted the University’s first African-American female student body president, her historically African-American sorority and the school’s broader black community. That day was their team’s first test covering breaking news. 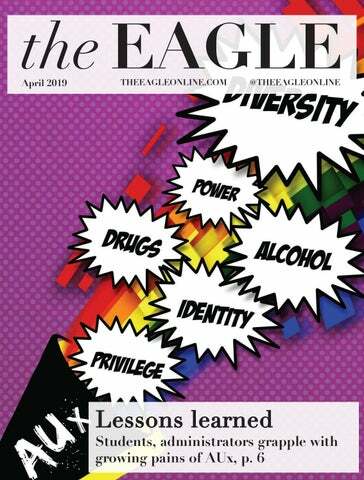 One year later, The Eagle interviewed five members of The Blackprint. Lumpkin, Jenna Caldwell, Amanda Nyang’oro and Zshekinah Collier spoke about their experiences covering a hate crime targeting black students. Freshman Kiarra Delouis joined the conversation, adding her experiences as a first-year student entering The Blackprint’s newsroom after the May banana incident. Their answers, transcribed below, have been lightly edited for clarity and length. Do you remember where you were when you first heard about the bananas in May 2017? Amanda Nyang’oro: I think I woke up, someone texted me and someone posted something on a group Facebook chat ... I woke up with that. Jenna Caldwell: I found out when one of my friends texted the photo to me early in the morning and they were like, “Are you ok?” I didn’t have time to process it. Kiarra Delouis: When I found out, I was finishing high school. I remember my teachers having more opinion on it than me. They brought it to my attention, this wasn’t something that I had found out through websites or social media … I just remember just noting it in my head. It wasn’t anything alarming to me where it was making or breaking my decision to come here. I definitely did Google it and ended up finding up out a little bit more about other incidents related to the banana one that occured. Zshekinah Collier: I usually wake up and check Facebook and am just scrolling in my bed. Someone that of course goes to AU posted it and I was shocked. Amanda Nyang’oro: It definitely circulated around Snapchat. What did you feel The Blackprint’s role was that week? Lauren Lumpkin: I felt like it was kind of our job, just being that our audience is black students and students of color. Our voice was really needed at that time and I remember people thanking us for our coverage … Things like that have been happening at AU for a while, but this was the first time we were putting our perspective on it. Amanda Nyang’oro: It was our first proper breaking news. Lauren Lumpkin: Just being black students, and being able to speak from our point of view and our experiences, was really important and it added important context that I don’t think would have been there otherwise. Jenna Caldwell: I don’t think we’ve ever reported a story so fast as we reported that. I remember earlier in the year … when the first banana incident happened and I remember it was kind of like people being unsure of how do we cover it, who do we talk to, what do we do. Finally, when the second event happened, we were like, OK, we need to spring into action. This is immediate. We have to cover this now. Amanda Nyang’oro: We wanted to make sure that everybody knew the facts. We wanted to make sure people knew the information that was out there. That was the fault of the other incident [when someone flung a banana peel at an African-American freshman in her dorm], because people didn’t know what was happening. We made sure that this one was clear. When you look back, do you ever feel there was more pressure on you to cover this story than other student news organizations? Lauren Lumpkin: I felt the pressure that probably most black students feel when incidents happen. I think in some way or another, black students give up a lot when these things happen because we’re the ones that are on the front lines doing activism and protesting. It’s us sacrificing our time, our sleep, our grades, our bodies doing this stuff. Whether or not I was with The Blackprint, I probably would have been protesting anyway. The pressure I felt was the pressure that all black students feel when hate crimes happen on campuses. Jenna Caldwell: Me and Lauren had jointly wrote the article after the incident happened. I just remember, afterwards, going to the It’s in the Air protest. I had a final the next day and it was my hardest class. I remember being there. I wasn’t even thinking about my finals … this was more important. I remember going to the library after and I just had such a headache. I was just sitting in the library, literally crying … because I was so exhausted from writing it … It was ridiculously draining. I didn’t study for my final or anything. Lauren Lumpkin: Not only are we reporting, but we’re in it. That’s usually something that doesn’t happen in media … Normally, you’re reporting on things that may be in your community but don’t necessarily directly impact you. This is something where, we’re living this and also trying to report on it and be unbiased. Which was really difficult, trying to be objective when obviously we had a very clear bias. That’s good about The Blackprint because I think we’re allowed to be a little biased just based on the nature of our reporting and who our audience is. I came into The Blackprint thinking, you know, what they teach you in journalism classes: objectivity is everything … There’s some things where you can’t be objective about, like racism. You don’t need to hear both sides about it. That’s when The Blackprint, really, we started to find our voice. We don’t have to do this fake objectivity stuff because we’re a special type of publication and people are OK with us having our opinions and our voices come through in our writing. Amanda Nyang’oro: Our readers read us because they have something in common with us. Not because we’re objective or because of what type of things that we cover. They look at us because they connect with our type of organization. Kiarra Delouis: I think that by being a subjective kind of publication, it makes it transparent and appealing to readers or maybe potential writers or potential affiliates of The Blackprint. Did you ever feel that there was something you could have done differently or better? Jenna Caldwell: Not having so many “ums” in our [Fox 5] interview. Lauren Lumpkin: I wish there was maybe more coverage. I think we had a few articles and a couple of those articles were multiple events mashed into one. It was finals and there was a lot going on. Jenna Caldwell: At a certain point, we weren’t really writing. We were taking videos of the protest or [streaming on] Periscope. Amanda Nyang’oro: We just wanted to have someone there. Zshekinah Collier: I didn’t cover it ... I regret not doing that. I think just at that time, I wanted to do more. But the same day as the protest, I had to leave campus ... I feel like I could have given more time. Jenna Caldwell: I think the only thing I regret is that I ended up attending [a] meeting with the provost, Scott Bass. They pretty much promised us that we would get a Black House [a space where Black students could come together to socialize], which I think is what that multicultural room upstairs [the Hub for Organizing, Multiculturalism and Equity, the multicultural student space spearheaded by former Student Government President Taylor Dumpson that officially opened in March] was supposed to be. I remember this one girl had told me to Facebook Live the whole thing. Lauren Lumpkin: They didn’t let us. Jenna Caldwell: I regret maybe just not recording it because that’s holding them accountable to the things they said. Editor’s note: After the banana incident, students requested that the University consider creating a Black House. HOME, which is in Mary Graydon Center, is a product of those discussions, school spokesperson Camille Lepre said. Professional media were restricted as to where they could be on campus that week. For example, reporters were told they could not physically enter Kay Spiritual Life Center for the town hall on May 2, 2017. Did you ever feel you were telling this story to the world, not just to our AU community? Jenna Caldwell: I remember one of our writers ... tried to go to a meeting. Lauren Lumpkin: It was the press conference. Jenna Caldwell: Jaha [Knight] tried to go to a press conference but they wouldn’t let her in because I guess The Blackprint wasn’t established ... That was kind of added pressure, we felt like we were being locked out of certain things that other news outlets had the upper hand on. Editor’s note: The Blackprint was not able to cover the press conference because Knight was not allowed to enter the room. AU was not aware that Knight was a writer for The Blackprint, school spokesperson Camille Lepre said. However, the press conference was open to all student media. For example, The Eagle was allowed to cover the press conference, but The Blackprint was incorrectly denied entry. Did you ever feel like you had more access because you are a campus outlet? Lauren Lumpkin: I was talking to Emem [Obot], [they were] like “Yeah, I’ll talk to you because y’all are The Blackprint. I won’t talk to The Eagle.” They weren’t the only person who said that to me. I guess it’s a privilege in a way. I even see that in professional journalism that I do. If I go and cover something happening at a black school or in a black community, people are more willing to talk to me because we are both black and they trust that we’re going to do things ethically and honestly… Not that all white reporters lie, but there’s a level of understanding that you’re going to tell the story the way it actually needs to be told. Amanda Nyang’oro: Our focus was on making sure that the students knew what’s happening … The first incident [when there were racist attacks against Anderson Hall residents involving bananas], we didn’t know what was happening and that was really frustrating. Making sure that the second incident really was covered well and people knew what was happening … that was really important to us. That was our main focus. Lauren Lumpkin: I was never like, “The [Washington] Post needs to see this.” I was like, students need to see this because nobody else is going to tell them. Zshekinah Collier: There was no media on campus [for parts of the week after the hate crime], but there were so many stories about us. I think that was interesting. Do you think that day changed how The Blackprint approached this year? Do you think it shaped your narrative as a publication and what you’d cover for the next year? Amanda Nyang’oro: I think it just helped us gain more of a reputation. We were more of a serious publication. We cover hard news, but we also cover culture, we also cover music, we also cover all these different things. We gained that level of reputation first from that incident. Zshekinah Collier: Someone called The Blackprint a blog and I was like, “no, that’s not what it is.” We do a little more than that. I think it definitely pushed me to want to do more news stories for the Blackprint. This article will be published in The Blackprint. To read their work, go here.